This section has a total of 30 brands. If you try all 15 mandatory questions and answer them accurately, then you earn 30 marks from this section yourself. In practice, it is not possible to answer all the questions correctly. So let's consider only 20 points in this section (it means you'll have to answer at least 10 questions accurately). Therefore, your score for PART-A should be 17-20 points. To achieve this score, candidates must prepare excellently for this section. According to the CSIR NET's General Aptitude Plan, candidates will have to focus on the Logical Reasoning and Quantitative Aptitude Sections. First, read the question clearly and try to understand its real meaning. Do not try to misinterpret it, otherwise you can misguide your solution path. Prepare your mind to cope with any twist and turn that can be resolved while the questions are resolved. Solve the short time by taking questions first and take the long questions later [only if you have enough time remaining to resolve them]. Try using tricks and short formulas to solve math questions instead of using long methods. Solving logical reasoning questions can be easy, if we use our presence of mind. Take help of the Diagrams or Charts to solve Part A questions. This is the easiest way to try questions with the minimum time limit. [You can also draw them for yourself, in case the questions do not have any illustrative diagram or graphic]. Do not waste your time guessing. Respond only when you are sure of it! Under the latter plan, the general aptitude document will have the negative mark of 0.25 deduction points for each wrong answer. So stay focused. 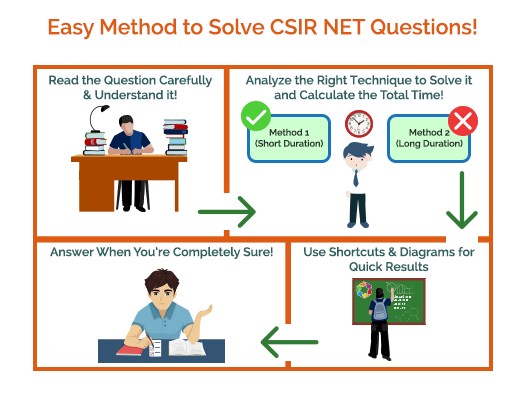 Therefore, we have provided the tips for preparing the CSIR NET exam for Part A, but if we look at Part B and Part C, these two sections contain the highest marks. These sections consist of questions of the chosen subjects. Any candidate aspiring to CSIR NET June 2017 can score 170 points if all the questions are answered properly. The marking scheme for each theme is different. How to Prepare for CSIR NET Chemical Science Exam ?